Dead Sea salt benefits for your skin have been reported for many years. But just how can these salts help you manage your eczema. The Dead Sea is renowned for being where you can go for some sun, and where you can float on water while reading a newspaper! Bordering Israel and Jordan, it is known for having an extremely high concentration of salt. It is so concentrated that no animal, fish or plant is able to live in it. This is why it is also known as the 'Sea of Salt, and the 'Sea of Death'. Although these salts may not allow anything to live there, they can be extremely beneficial for your eczema. The salts are full of minerals. Around 27 to be exact! The salts are readily available to buy from health shops, online and in some supermarkets. One thing to be aware of is that some of the salts that you can buy are not pure Dead Sea salts. Some are put through processes that can diminish their mineral content. Buy the salts from a reputable company. One that sells pure salts, with a high mineral content. Using in the bath is one of the best ways that Dead Sea salt benefits eczema. For an adult, fill a bath up with warm water. Add the salt, and mix well. Then have a soothing soak. But for no more than 20 minutes. Rinse the skin after. For a child, use less water and less salt. If you half fill the bath, then use half the amount of salt. The amount you use is debatable. Some say to use 2lbs, which maybe a lot if you are using the salts 3 times a week. I mix a couple of cupfuls in my bath. When I get a flare up it is usually on my hands, so I use the salts to help keep my skin moisturised. For my hands I use the following method. Using the salts as a soak is particularly helpful if you have eczema on your hands or feet. In a bowl, put around 2.5 litres of warm water. The amount of salt you use, again, depends on the severity of your eczema, and you may have to take the cost into consideration. I add a cupful of salt to the water, and mix it well. Then soak my hands for up to 30 minutes. Rinsing them after, then applying a moisturiser. You can use a small amount of the salt directly on your skin. Dampen your skin. In a circular motion, gently apply the salt to the area that you want to soften. Leave it on there for a few minutes before rinsing off. This technique can help to soften your skin. Just be careful of using it directly on inflammed or broken skin. It can sting! So probably best avoided. Using Dead Sea products is becoming more popular. The salts are found in other products, but you can also buy Dead Sea mud products too. Visitors to the Dead Sea can cover themselves in the mud, which has many of the same properties as the salts. As with all products, check for any added ingredients. The more natural it is, the better it is for your skin. 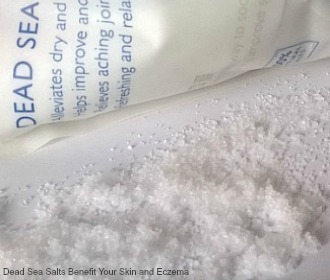 It may take up to a couple of months before you see how Dead Sea salts benefits your eczema. It is worth persevering with it. The salt works on the natural healing of your eczema and your skin, so may take a little longer to show any improvement.